It’s time for the weekly highlights, slightly earlier than usual since the Mob Psycho post will be delayed and we wanted to make up for it. Fans of digital animation and those who want to learn more about it: get ready, this one’s for you. Anime saw the comeback of Shingo Yamashita this week. He had recently helped out fellow Yozakura Quartet staff on the Kurage no Shokudou OVA, but that very minor task aside he had been away from the industry for about two years – no wonder so many animators were glad to welcome him back when he announced his Twin Star Exorcists opening had just aired. Yama’s prowess as an action animator is well known; his long titanic fight in Yozakura Quartet Hoshi no Umi and the still controversial Naruto Shippuuden #167 are often mentioned amongst the most memorable pieces of action in modern anime. Given an interesting setpiece he always manages to imbue a battle with impressive senses of scale and dynamism. The fact that Birdy Decode’s action sequences – which obviously includes Yama’s outstanding work – heavily inspired Zack Snyder when it came to filming Man of Steel has become a popular piece of trivia. Saying that he’s earned everyone’s respect is a bit of an understatement. And that’s all well-deserved praise, yet it does him a disservice as an artist to imply action is all he’s capable of; for a long time he showed a character acting finesse more akin to that of traditional animators, despite his unmistakably digital output. Through sharp timing and rich body motion alone he can craft immensely expressive doodles. Form is always a secondary concern, to the point of often getting rid of the outlines constricting the characters. Those aren’t required when he can achieve nuanced emotion with his shadows and flat shapes. 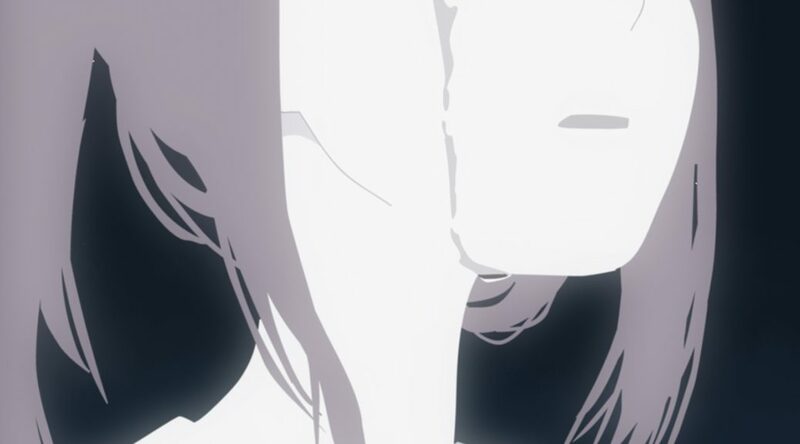 And those sensibilities affect his work as a director as well, of course; his most ambitious project to date in that regard is Yozakura Quartet #10, a mostly quiet breather in an otherwise high tension action series. While it’s understandable that he’s known for his memorable fights, I wish more people paid attention to his ability to portray intimate moments and warmth. 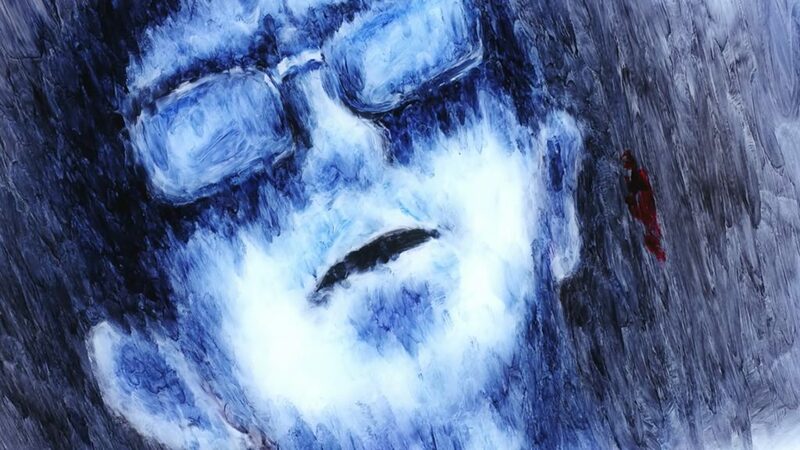 But even beyond his range as an animator, to fully understand Yama’s influence you have to think of him as an ideologue of sorts of a small artistic movement. The idea of the web-generation of animators as a single entity doesn’t quite work anymore since there’s been multiple waves of artists, but it’s clear that Yama is a webgen spearhead nonetheless. He wields massive influence as a creator himself, and constantly works on innovating the craft; just like ryo-chimo focuses on improving tools like Flash and auto-tweeners to help other artists, Yama tries to expand the limits of what full digital animation can do – and that’s what makes him even more interesting as a director than as a key animator, despite his ridiculous strength as the latter. Traditional vs digital animation debates are pointless at best, but you can’t deny that there are quirks and tendencies inherent to each format, and it’s Yama’s roots that explain his interest in steps like photography and composite; a tablet animator is obviously closer to the idea of applying digital effects than someone who draws on paper. Reshuffling the production steps and who they’re assigned to is interesting, and by expanding the boundaries of what the job of an “animator” entails we might see fascinating new styles like his flourish. Perhaps the ideal – and thus not necessarily feasible on a widespread scale – conclusion to this approach would be putting the key animator in charge of the photography too, effectively controlling how the cut they came up with will look in the end, thus almost elevating them to the position solo auteurs have. Unlike some western equivalents, Japanese animation puts the key animator in charge of every single element contained in the layout (even when they’re ultimately produced by another department), which seems compatible with this idea. Professional animation is restrictive and standardized, but this might be the direction interesting outliers in the future take. I’ve seen critiques that the webgen style, if such a thing even exists, is becoming stale. The easily recognizable loose, stylized and flat drawings have become commonplace. The industry has taken an undoubtedly healthy step towards the integration of those artists in otherwise traditional projects, so those approaches are no longer exclusive to exceptional digital-focused productions. As a fan of that kind of animation I don’t fully agree with the detractors, but I still believe that the industry needs pioneers like Yama. We can only hope he starts regularly working on anime beyond short commercials once again. So what about, you know, the thing Yama actually did to trigger my gushing about him. The second opening for Twin Star Exorcists was an excellent successor to Yasuomi Umetsu’s first one; you can say Pierrot’s effort with the series has been unimpressive, but you can’t deny that they know how to sell the product with these intros. Some of Yama’s previous sequences like Birdy Decode 2’s ending were built around a self-contained narrative, but this time he simply showcased the series’ spirit as filtered through his personal lens. He put his army of young animators to good use with those characteristic huge setpieces I mentioned earlier, once again building action that doesn’t just feel dynamic but also aims to impress through its scale. The sequence features many cuts dyed with different lighting; Yama is aware of his strengths, and will set a scene in a beautiful dusk just because he can. But it’s not just flourish, he’ll also use delicate lighting and his vanishing lineart to make the intimate moments feel soft and warm – something that’s not new for him. Even his shadow animation makes an appearance in that short cut with Mayura, an ominous usage of that style similar to what he did in Shinsekai Yori. Despite his rather long break, many top digital animators were glad to come to his call – Shun Enokido, Shin Ogasawara, miso, the lineup is impressive and even contains people who couldn’t be properly credited because they’re currently tied to ongoing projects. Yama’s comeback was an exciting event for the industry itself. This opening might not even be his most impressive piece, but the idea of him working on anime again is one of the best news this year. One opening sequence pretty much entirely kidnapped this week’s highlights post, but that was more out of love for a fascinating creator than due to a lack of interesting material. 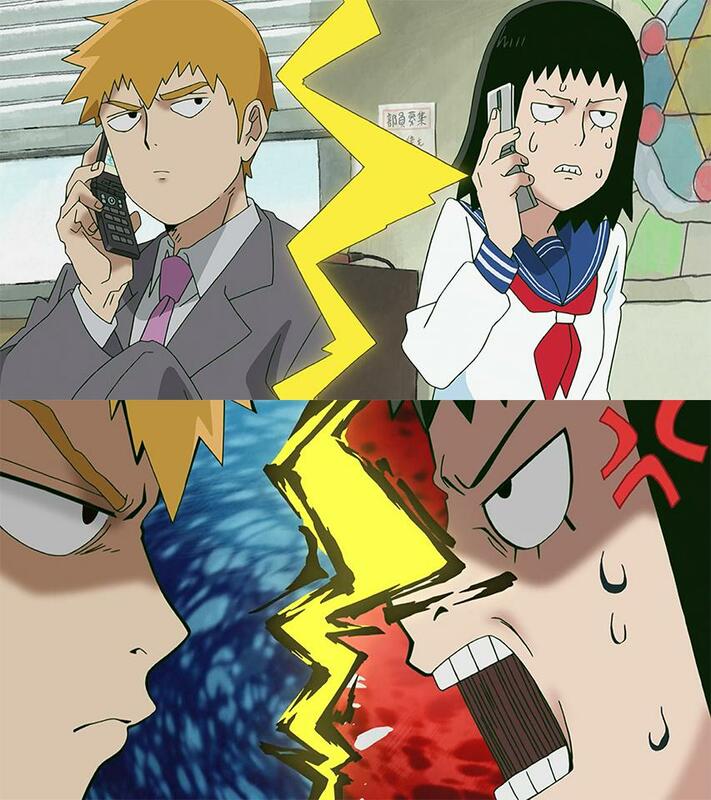 If I were to briefly comment on something else, it would be – you guessed it – Mob Psycho 100. I could talk about Miyo Sato’s paint on glass ending sequence, but I feel like the quota for OP/ED discussion has been more than fulfilled. 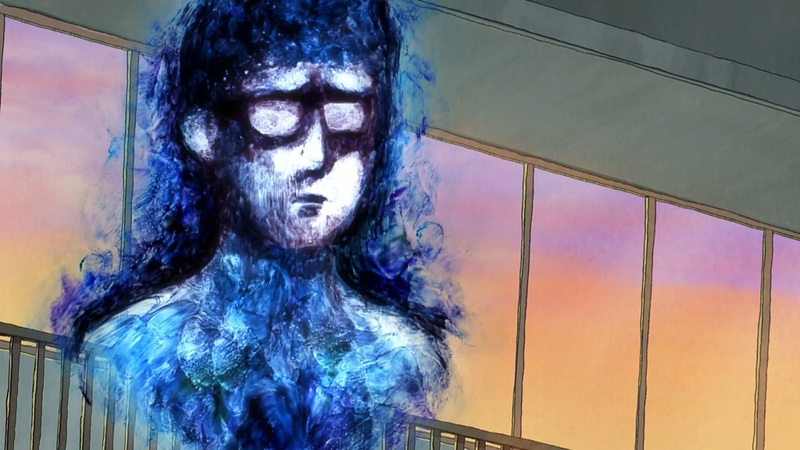 I’ll limit myself to saying it’s a gorgeous sequence and that I’m glad she really is a regular animator for the series – Tachikawa is living up to his promise of visual surprises, as I mentioned last week when I praised Mob Psycho’s visual range as a core element of the series. What I felt most strongly after this episode was… relief. Relief that this series doesn’t need to rely on its core staff to be a compelling spectacle, and that it doesn’t need the flashy action of the first episode to stand out. Rich layouts and effective storyboarding make its relative downtime interesting, and even seeing a small silly conflict escalate is amusing. 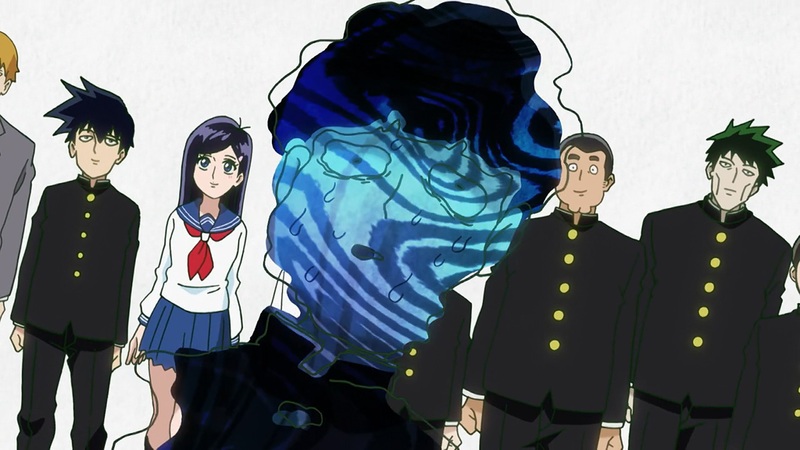 But more importantly, Mob’s psyche is taken into account; neat scenes like him visibly losing his sense of self, with loose lineart that can’t even contain him, while the rest of the world that he perceives as sure of what they want to be remain normal. The show’s carefully building up to what will presumably be his first emotional explosion next week as the ongoing countdown ends and his powers reach 100%, and it’s scenes like that what will make the event more effective. It’s a good sign when I end a write-up feeling that anime is fantastic despite only having been able to talk about a couple things. I already have some interesting work I want to include on next week’s post, despite that covering a week that technically hasn’t even started. Cartoons were good after all, people. Hmm, mind to explain why outline would be needed to express nuanced emotion? Most of the time, successful portrayals of complex emotions are achieved through very detailed drawings of expressions. Yama can do away with outlines and facial features altogether and still convey those through body motion. Remember the time that people thought the last episode of Decode 02 had terrible animation? Yeeep. Yama isn’t even one of the wildest animators (Birdy even had Tomoyuki Niho’s work “””fixed””” on the DVD release because people couldn’t deal with his raw work), but whenever he gets loose it always attracts those complaints. People *still* yell about jellopain. Who in your opinion are the wildest anime animators just in general? In the current industry, the most idiosyncratic animators are probably people like Niho, Ohira, Shinji Hashimoto, Hokuto Sakiyama, Tamotsu Ogawa… I hesitate to call them ‘polarizing’ – that seems more appropriate for some of the young web animators that don’t have strong fundamentals and sometimes get questioned by animation fans. Niho&co simply have unique styles that immediately put off people who want anime to always look ‘normal’ and on-model.